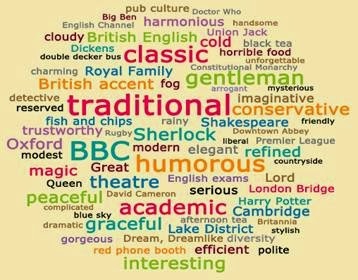 When we asked 350 of our Weibo (Chinese Twitter) followers to come up with one word to describe the UK, here's the colourful result. It's not a big sample, and it's people who already have a reasonable knowledge of Britain, but it's kind of revealing. The usual clichés: Big Ben, fog, fish and chips, red phone booth etc; and the usual contradictions: traditional and modern; rainy and blue sky; humorous and serious; conservative and liberal; reserved and dramatic; modest and arrogant... The two surprises for me were the inclusion of 'dreamlike' (eh?) and the omission of Beckham.